The aim of this study was to evaluate the corneal biomechanical properties using the ocular response analyzer (ORA) in type 2 diabetic patients. The ORA is a device developed in recent years and reveals the biomechanical properties of the cornea. It reflects certain biomechanical properties of the cornea, such as corneal hysteresis and corneal resistance factor. A total of 150 eyes of 75 patients were enrolled in a cross-sectional prospective comparative study from May 2015 to May 2016. Patients were divided into three equal groups. ORA and HbA1c evaluation were carried out for all patients. The corneal hysteresis of the study groups ranged from 5.5 to 9.8 mmHg for the control group (group A), and it ranged from 6.00 to 11.4 mmHg for the diabetic group (group B), whereas it ranged from 9.5 to 15.20 in the diabetic group (group C). The corneal resistance factor of the study groups ranged from 5.8 to 10.00 mmHg for the control group (group A), from 6.2 to 12.00 mmHg for the diabetic group (group B), and from 8.90 to 16.10 mmHg for the diabetic group (group C). The Goldmann-correlated intraocular pressure of our study groups ranged from 10 to 30 mmHg for the control group (group A), from 10 to 22 mmHg for the diabetic group (group B), and from 10.5 to 26.00 mmHg for the diabetic group (group C). The corneal-compensated intraocular pressure of the study groups ranged from 10.8 to 25 mmHg for the control group (group A), from 11.2 to 30 mmHg for the diabetic group (group B), and from 10.00 to 28.00 mmHg for the diabetic group (group C). The corneal biomechanics in diabetic groups are significantly higher than those in the control group. Type 2 diabetes mellitus is a systemic disorder affecting the eyes in many different forms and it is characterized by hyperglycemia . Diabetic patients have a higher risk for epithelium healing problems, functional disorders of the corneal endothelium, and permanent stromal edema after intraocular surgical procedures . Many studies have shown that diabetes is commonly associated with thicker corneas, and thus, in many diabetic patients, changes in the structure of the cornea are present . The ocular response analyzer (ORA) is a device developed in recent years and reveals the biomechanical properties of the cornea. It reflects certain biomechanical properties of the cornea, such as corneal hysteresis (CH), corneal resistance factor (CRF), Goldmann-correlated intraocular pressure measurement (IOPg), and corneal-compensated intraocular pressure (IOPcc). CH gives an idea about the viscosity of the cornea; thus, it reflects the changes in the corneal stromal collagen organization. CH is not affected by the central corneal thickness. The ability to measure this effect is the key to understanding the biomechanical properties of the cornea and their influence on the intraocular pressure measurement process. CRF readings showing the elastic properties of the cornea are partially independent of intraocular pressure but have a strong relationship with central corneal thickness. CH and CRF are good indicators to identify the biomechanical properties of the cornea . Glycosylated hemoglobin (HbA1c) is the metabolic product of a stable connection of glucose to the N-terminal valine of the β-chain of hemoglobin. It defines the average blood glucose level of the preceding 3 months and shows the result of diabetes treatment. Normally, the average HbA1c level varies between 4 and 6.4%. Higher values are a sign of insufficient blood glucose control and poor metabolic control. An HbA1c target of 7.0% for the treatment of diabetes is generally accepted to lower the risk for long-term microvascular or macrovascular diabetes complications . Group C: This group included 50 eyes of patients having diabetes mellitus type 2 with HbA1c greater than 7. Presence of systemic diseases other than diabetes mellitus that affects corneal biomechanics. Presence of collagen diseases such as rheumatoid or lupus erythromatous. Presence of corneal diseases or dystrophy. Presence of keratoconus or suspicion of keratoconus. Presence of glaucoma or suspicion of glaucoma. We planned to evaluate the effect of diabetes mellitus on the corneal biomechanics. History of previous ocular surgeries. Patients with a suspicion of corneal disorder such as early keratoconus were examined by a cornea specialist in our department, and corneal topography measurements were performed to exclude any form of keratoconus. Investigations were carried out in the form of ORA (Reichert Technologies, Depew, New York, USA) to measure CH, CRF, IOPg, and IOPcc. Investigations were carried out to diagnose diabetic patients in the form of glycated hemoglobin evaluation (HbA1c). All diabetic patients received a diagnosis of diabetes according to the most recent guidelines published by the American Diabetes Association (2004). HbA1c was obtained by means of venous blood sampling. HbA1c is the product of a stable linkage of glucose to the N-terminal valine of the β-chain of hemoglobin. It defines the average blood glucose level of the previous 2–3 months. It reflects the success of diabetes therapy. Thus, it is possible to assess the glucose metabolism of the body more objectively and in long-term compared with a blood glucose sample, which reflects only the current sugar level. Usually 4–6.4% of hemoglobin is glycosylated. Higher values are a sign of insufficient blood glucose control. It also has advanced our understanding of the association between glycemic control and long-term complications of diabetes. The ORA is a noncontact tonometer with automated eye centration alignment. Participants were seated on a chair and instructed to place their foreheads on the headrest of the ORA device that was made to match their height by adjusting the height of a table. To avoid startling the participants, they were first briefed about a noncontact probe that would move toward the eye and emit a sudden but gentle puff of air. Participants were told to focus on a blinking red light in the device. Thereafter, the ORA was activated and the air puff was emitted onto the center of the cornea. The ORA readings were obtained consecutively and only good quality readings were stored. If poor-quality waveforms were obtained, they were deleted, and a new measurement was taken. Only the readings with liability more than 7 were stored. The manufacturer defined good-quality readings as both force-in and force-out applanation signal peaks on the ORA waveform being fairly symmetrical in height. The ORA displayed a graphic representation of the corneal response after each measurement [Figure 1]. Figure 1: Ocular response analyzer (ORA) signals. [Figure 2] and [Figure 3] represent the ORA signals provided from our diabetic patients during our study. 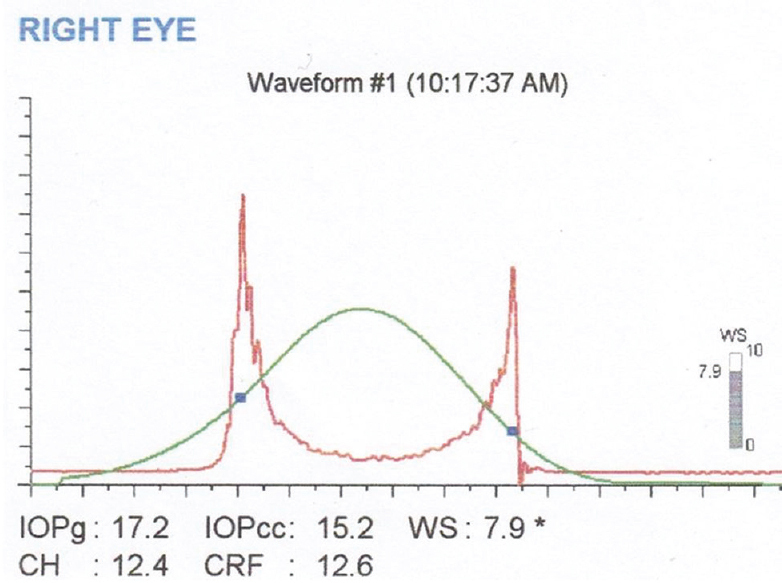 Figure 2: Ocular response analyzer (ORA) signal of the right eye of patient number 14 of the diabetic group. 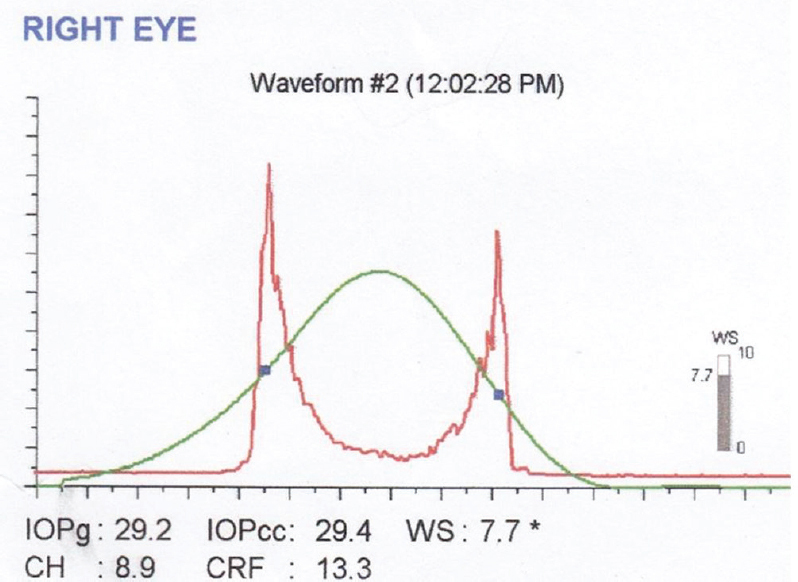 Figure 3: Ocular response analyzer (ORA) signal of the right eye of patient number 39 of the diabetic group. [Figure 4] represents the ORA signal provided from a normal individual in normal group during our study. 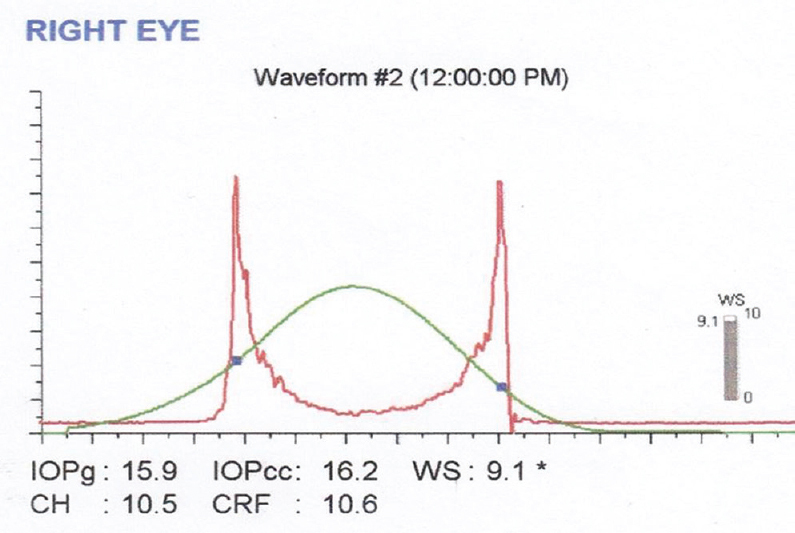 Figure 4: Ocular response analyzer (ORA) signal of the right eye of patient number 11 of the normal group. The red curve is the 'dynamic map' of the cornea obtained during the rapid in/out deformation. That dynamic process generated two signal peaks that defined the two applanation states. The difference between these inward and outward motion applanation pressures (P1 and P2) was called CH. 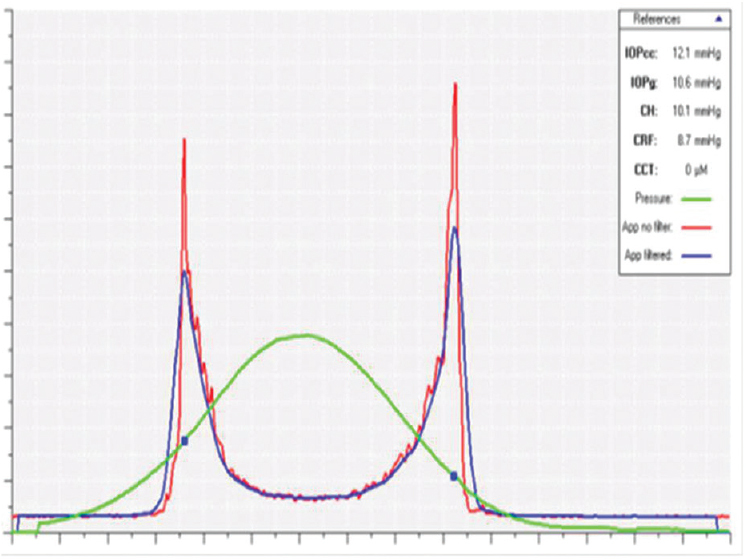 The ORA software utilized the CH to generate two additional parameters: the IOPcc and the CRF. An IOPg was also provided by the machine. The collected data of normal and diabetic patients were tabulated in spreadsheets using Microsoft Office Excel 2007 (Microsoft Corporation, Chicago, USA). The coded data were arranged for use in SPSS Statistical Computer Package (SPSS 2011, version 20; IBM Corporation, USA). The first step in statistical analysis was to conduct descriptive statistics on the file containing the collected data of the 80 patients. Descriptive data were summarized and presented herein for numerical data as the mean ± SD. Categorical data (i.e. non-numerical data) are expressed in the percentage that each category represents in the whole sample. Throughout the analysis, numerical data are considered normally distributed based on the results of the Kolmogorov–Smirnov test of normality using SPSS package. The independent-samples t-test procedure was used to compare means for the two groups of cases – namely, normal and diabetic. As the patients of each group were randomly selected, any difference in response or measure is considered to be due to diabetes and not other factors. The correlation between two different numerical variables was determined using bivariate correlation procedure, which computes Pearson's correlation coefficient (r) and its significance level. Throughout the statistical analysis, the results were considered statistically significant when the significance level or P value was 0.05 or less for two-tailed test. A total of 150 eyes of 75 patients were enrolled in our study. Patients were selected from ophthalmology outpatient clinics in Giza Research Institute for Ophthalmic Researches. Our study is a cross-sectional prospective comparative one. The study was carried out from May 2015 to May 2016. The age of our study groups ranged from 34 to 71 years, with an average of 54.93 ± 9.02 years for the control group (group A), 58.50 ± 6.38 years for group B, and 57.66 ± 7.5 years for group C [Table 1]. Our study included 71 eyes of male patients and 79 eyes of female patients (female eyes: male eyes ratio was 1: 1.11). The control group (group A) included 23 male and 27 female similar to the diabetic group (group B), whereas group C included 25 male and 25 female patients [Table 2]. The HbA1c in our study ranged from 5 to 6.2% with an average of 5.663 ± 0.33% in the control group (group A), from 5 to 7% with an average of 6.42 ± 0.432% in the diabetic group (group B), and from 7 to 12.6% with an average of 7.2169% ±1.932 [Table 3]. The spherical equivalent in our study ranged from −6.00 to + 7.13 in decimals and with an average of −0.01 ± 1.62 for the control group (group A), from −8.00 to + 3. 0 with an average of −0.79 ± 3.02 for the diabetic group (group B), and from −7.5 to 2.5 with an average of −0.528 ± 2.24 in group C [Table 4]. The CH of the study groups ranged from 5.5 to 9.8 mmHg with an average of 7.11 ± 0.846 mmHg for the control group (group A). It ranged from 6.00 to 11.4 mmHg, with an average of 8.295 ± 1.091 mmHg for the diabetic group (group B). However, it ranged from 9.5 to 15.20 with an average of 11.299 ± 1.178 for the diabetic group (group C) [Table 5]. The CRF of the study groups ranged from 5.8 to 10.00 mmHg, with an average of 7.17 ± 0.979 mmHg for the control group (group A), from 6.2 to 12.00 mmHg, with an average of 8.6902 ± 1.2519 mmHg for the diabetic group (group B), and from 8.90 to 16.10 mmHg with an average of 11.8928 ± 1.5419 mmHg for the diabetic group (group C) [Table 6]. The human cornea is a viscoelastic tissue that can be described by two principal properties: (a) a static resistance component (characterized by the CRF), for which deformation is proportional to applied force, and (b) a dynamic resistance component (characterized by CH), for which the relationship between deformation and applied force depends on time, both CH and the CRF are measured using a dynamic bidirectional applanation process using the ORA . Diabetes significantly impacts the morphological, metabolic, physiological, and clinical properties of the cornea. Chronic hyperglycemia resulting from poorly controlled diabetes leads to tissue modifications and changes in the corneal structure. Glucose can act as a collagen cross-linking agent with the help of advanced glycation end products (AGEs) . The presence of AGEs in tissues leads to an increase in collagen cross-linking that result in an impairment of tissue function. It is thought that increased collagen cross-linking in the corneas of diabetic patients results in gradual corneal stiffening, increased corneal thickening, and biomechanical changes. Therefore, the aim of our clinical study was to investigate whether the biomechanical parameters (CH and CRF) of the cornea are altered in diabetes according to the HbA1c level. To compare the metabolic status of diabetic and nondiabetic individuals, HbA1c was obtained. Our population study was divided into three equal groups: group A included 50 eyes of 25 normal individuals; group B included 50 eyes of 25 patients with diabetes mellitus type 2 with HbA1c less than 7; and group C included 50 eyes of 25 patients with HbA1c greater than 7, providing a reference to establish the typical values and ranges of corneal biomechanical parameters. In our study, the mean CH in the control group (group A) was 7.1186 ± 0.84660 mmHg in comparison with the mean CH in the diabetic group (group B), which was 8.2958 ± 1.09100 mmHg, and the mean CH in group C, which was 11.2992 ± 1.17842. It was statistically significantly higher in diabetic patients when compared with the control group and was statistically significantly higher in group C diabetic patients (P = 0.00). Our results could be attributed to increased glucose in diabetes that acts as a collagen cross-linking agent with the help of AGEs. AGEs accumulate in collagen proteins, resulting in the formation of covalent cross-linking bonds and gradual corneal stiffening. Kotecha et al. mentioned in their results that CH is slightly higher in diabetic eyes (P = 0.21). In contrast, Sahin et al. reported that the mean CH in the control group was 10.41 ± 1.66 mmHg in comparison with the mean CH in the diabetic group, which was 9.51 ± 1.82 mmHg. He also reported that the mean CH was significantly lower in diabetic patients when compared with the control group (P = 0.0001). He attributed the decrease in CH to an alteration in the collagenous components due to collagen cross-linking, suggesting that the dampening effects of the cornea decrease because of diabetes and were induced to increase during the cross-linking of collagen fibrils. Meanwhile, Goldich et al. , Hager et al. , and Cankaya et al. disagreed with our results as they noted that there was no statistically significant difference between the control and diabetic groups as regards CH values. They did not provide any explanations. In the study by Cankaya et al. , the mean CH in the control group was 9.41 ± 0.5 mmHg and the mean CH in the diabetic group was 9.44 ± 0.62 mmHg (P = 0.738). Scheler et al. also disagreed with our results as he showed that there were no differences detected between healthy controls and patients with well-controlled diabetes as regards CH. He reported that the diabetic changes caused by increased glucose levels with a consecutive formation of AGEs seemed not to be surprising in a group of patients with diabetes who had a normal HbA1c. The hypothesis of Scheler et al. was confirmed by the studies by Odetti et al. and Traverso et al. , as they reported that insulin may reduce or exaggerate the effect of diabetes, which he showed in insulin-dependent patients with diabetes. Scheler et al. also noted that CH was higher in poorly controlled diabetic patients than in the control group. In our study, the mean CRF value of the control group (group A) was 7.1731 ± 0.97952 mmHg in comparison with 8.6902 ± 1.25195 mmHg in the diabetic group (group B) and 11.8928 ± 1.54254 in group C. The difference between the three groups was significantly higher in diabetic patients and more significantly higher in group C (the diabetic group) (P = 0.001). There were previous studies that showed similar results to ours, such as the studies by Goldich et al. and Kotecha et al. , who reported a P value of 0.001. They did not provide any explanation. Cankaya et al. also showed similar results to ours as they reported that the mean CRF in the control group was 10.56 ± 0.5 mmHg in comparison with 11.58 ± 0.6 mmHg in the diabetic group. They also reported that the difference between the control and diabetic groups was statistically significantly higher in the diabetic group compared with the control group (P < 0.01), but they did not explain this finding. In contrast, Sahin et al. did not agree with our results. They denoted that there were no statistically significant differences between the control and diabetic groups (P = 0.8) and the mean CRF in the control group was 10.36 ± 1.97 mmHg and the mean CH in the diabetic group was 10.32 ± 1.76 mmHg. They could not find an exact explanation for their finding, but it matched the findings of Scheler and colleagues (30). Scheler et al. also did not agree with our results, as he mentioned that there were no differences detected between healthy controls and patients with well-controlled diabetes as regards CRF. However, there were statistically significantly higher differences comparing the control group with the poorly controlled diabetic group. In our study, we wanted to investigate whether the biomechanical parameters (CH and CRF) of the cornea were altered in diabetes and whether they are affected by diabetic control; we correlated CH and CRF with HbA1c. As regards CH and duration of diabetes in the diabetic group (group B), the correlation was a weak positive linear correlation (r = 0.273; P = 0.089). As regards CH and HbA1c, in the control group (group A) there was almost no correlation between the two (r = 0.005; P = 0.974), but in the diabetic group (group B) there was a weak positive linear correlation (r = 0.129; P = 0.427). This elevation in HbA1c leading to a slightly increased CH indicate an increase in the viscosity of the ground substance. The increased viscosity is associated with higher corneal shearing strength and increased damping. This increased damping effect, which is reflected in a higher CH, is most likely due to the glycosylation of proteoglycans and glycosaminoglycans (the Maillard reaction) with a consecutive formation of AGE. Diabetes reduces the washout of proteoglycans and glycosaminoglycans, as they are connected strongly among each other compared with nondiabetic patients. This 'fixation' of the glycosaminoglycans can change the biomechanical properties of the cornea by increasing the damping capacity. However, Sahin et al. disagreed with us as they reported that neither HbA1c nor disease duration had any statistically significant effect on CH (P > 0.05). Kotecha et al. disagreed with our results as they confirmed the findings of Sahin et al. . Sahin et al. proposed that there was no association between CH and HbA1c (r = 0.1; P = 0.44). However, Kotecha et al. agreed with our results in having a positive association between duration of diabetes and CH (r = 0.16; P = 0.23). They reported that a longer duration of diabetes was associated with a greater CH, although this trend did not achieve significance. Del Buey et al. disagreed with our results as they proposed that CH is significantly influenced by the viscosity of the ground substance and a decrease in viscosity leads to a decrease in CH. As regards CRF and duration of diabetes in the diabetic group (group B), the correlation revealed a weak positive linear correlation (r = 0.237; P = 0.141). As regards CH and HbA1c, in the control group (group A) there was almost no correlation between the two (r = −0.092; P = 0.570). However, in the diabetic group (group B) there was a moderate positive linear correlation (r = 0.353; P = 0.025). However, Sahin et al. disagreed with our results as they reported that neither HbA1c nor disease duration had any statistically significant effect on CRF (P > 0.05). Moreover, Kotecha et al. disagreed with our results as they found no correlation between CFR and HbA1c (r = 0.07; P = 0.60) and no correlation was found between CRF and duration of diabetes (r = 0.11; P = 0.39). Kotecha et al. proposed that CRF is strongly associated with corneal stiffness. In our study, the mean HbA1c in the control group (group A) was 5.6366 ± 0.33186% and 6.4262 ± 0.43890% in the diabetic group (group B) and 9.5880 ± 1.44443% in the diabetic group (group C). Kotecha et al. reported that the mean HbA1c for the diabetic group was 7.2 ± 1.4% (P = 0.69). Sahin et al. also proposed that the mean HbA1c in the diabetic group was 7.31 ± 1.53%. Scheler et al. proposed that the mean HbA1c was 5.44 ± 0.46% in the control group, 6.00 ± 0.78% in the diabetic group 1, and 8.58 ± 2.44% in the diabetic group 2. Group 1 had HbA1c less than 7% and group 2 had HbA1c of at least 7%; HbA1c was statistically significantly different between the control group and all patients with diabetes (groups 1 + 2) (P = 0.0001). In our study, the duration of diabetes was 10.48 ± 5.39 years in the diabetic group (group B), whereas Sahin et al. proposed that the mean diabetes duration in their study group was 13.5 ± 6.3 years. The corneal biomechanics in diabetic groups are significantly higher compared with those of the control group, as the mean CH is 9.6 ± 1.89 mmHg in the control group (group A) and 11.29 ± 2 mmHg in the diabetic group (group B). The difference in CH between the three groups is statistically highly significant (P = 0.00). Meanwhile, the mean CRF is 9.48 ± 1.745 mmHg in the control group (group A) and 11 ± 2.29 mmHg in the diabetic group (group B) and the difference in CRF between the two groups is statistically highly significant (P = 0.001). In the control group, there is no correlation between CH and the average level of HbA1c (r = 0.005; P = 0.974). However, there is a weak positive linear correlation between CH and the average level of HbA1c in the diabetic patients (r = 0.129; P = 0.427). There is a very weak negative linear correlation between CRF and the average level of HbA1c in the control group (r = −0.092; P = 0.570). However, the correlation between it and HbA1c in the diabetic group is a moderate positive linear correlation (r = 0.237; P = 0.141). Aiello LM, Cavallerano JD: Ocular complications of diabetes mellitus. In: editors, Kahn CR, Weir GC. Joslin's diabetes mellitus. 13th ed. Philadelphia: Lea and Febiger; 1994. 771–793. Goebbels M, Spitznas M. Endothelial barrier function after phacoemulsification: a comparison between diabetic and nondiabetic patients. Graefes Arch Clin Exp Ophthalmol 1991; 229:254–257. Larsson LI, Bourne WM, Pach JM, Brubaker RF. Structure and function of the corneal endothelium in diabetes mellitus type I and type II. Arch Ophthalmol 1996; 114:9–14. Chihara E. Assessment of true intraocular pressure: the gap between theory and practical data. Surv Ophthalmol 2008; 53:203–218. Laakso M, Cederberg H. Glucose control in diabetes: which target level to aim for? J Intern Med 2012; 272:1–12. Dupps WJJr, Wilson SE. Biomechanics and wound healing in the cornea. Exp Eye Res 2006; 83:709–720. Sahin A, Bayer A, Özge G, Mumcuoglu T. Corneal biomechanical changes in diabetes mellitus and their influence on intraocular pressure measurements. Invest Ophthalmol Vis Sci 2009; 50:4597–5604. Kotecha A, Oddone F, Sinapis C, Elsheikh A, Sinapis D, Sinapis A, et al. Corneal biomechanical characteristics in patients with diabetes mellitus. J Cataract Refract Surg 2010; 36:1822–1828. Hager A, Wegscheider K, Wiegand W. Changes of extracellular matrix of the cornea in diabetes mellitus. Graefes Arch Clin Exp Ophthalmol 2009; 247:1369–1374. Cankaya C, Gunduz E, Doganay S, Ulutaz O. Corneal biomechanical characteristics, intraocular pressure and central corneal thickness in patients with type2 diabetes mellitus. J Clin Med Res 2012; 4:79–83. Scheler A, Spoerl E, Boehm AG. Effect of diabetes mellitus on corneal biomechanics and measurement of intraocular pressure. Acta Ophthalmologica 2012; 90:e447–e451. Odetti P, Traverso N, Cosso L, Noberasco G, Pronzato MA, Marinari UM. Good glycaemic control reduces oxidation and glycation end-products in collagen of diabetic rats. Diabetologia 1996; 39:1440–1447. Traverso N, Odetti P, Pronzano MA, Marinari UM, Cottalasso D. Intensive insulin treatment reduces the accumulation of oxidation and glycation end-products in diabetic rat collagen. Aging (Milano) 1997; 9:432–433. Del Buey MA, Cristobal JA, Ascaso FJ, Lavilla L, Lanchares E. Biomechanical properties of the cornea in Fuchs' corneal dystrophy. Invest Ophthalmol Vis Sci 2009; 50:3199–3202.